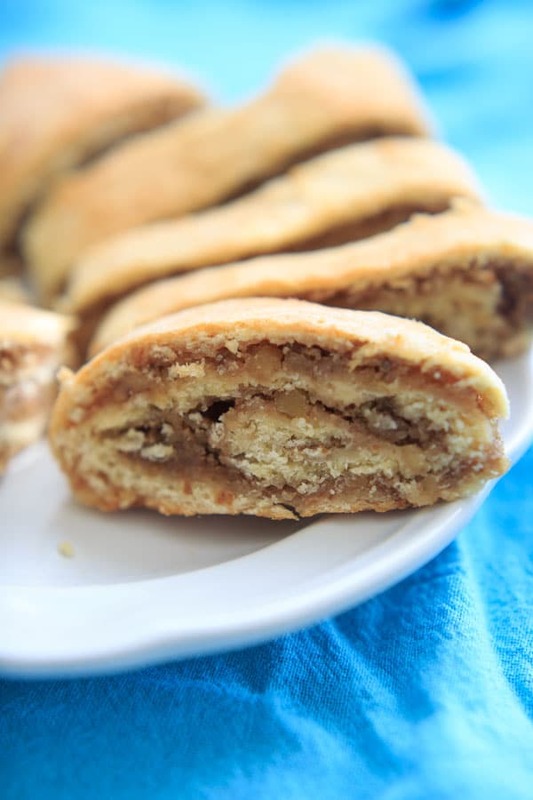 Nana’s Potica recipe – a Slovenian nut roll traditionally served at Easter and Christmas. Make this to give as gifts or for dinner parties. My Nana was an awesome baker. When I would visit her in summers growing up, I would spend hours leafing through her cookbooks with dreams of owning my own bakery when I grew up. Little did either of us know that my fascination would instead turn into a food blog one day. I’m actually trying to imagine trying to explain what a blog is to my Nana. I’m not sure she even understood what a computer is! I know I’m so lucky to have these memories of her since most people never even know their great-grandparents, let alone get to spend time with them in the kitchen. My Nana passed away a couple weeks ago. She would have turned 99 years old this summer. Maybe her baking had something to do with her long life? I’ll believe it. 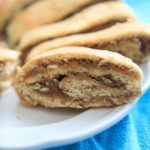 I’ve shared her Easter bread recipe on here before, and another recipe she would make for the holiday is this potica (pronounced po-teet-sah), a Slovenian nut roll traditionally made for Easter and Christmas. I’d never actually made the potica before until now, so this seemed like a perfect way to honor Nana. 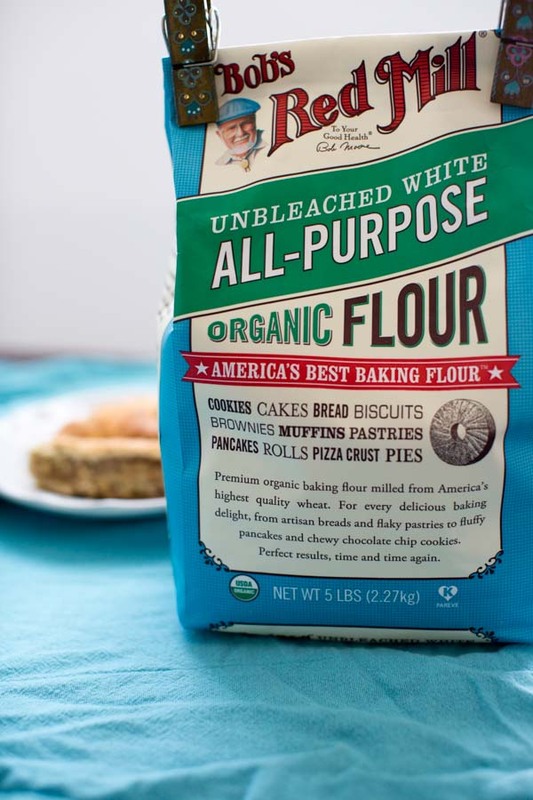 I had the opportunity to work with Bob’s Red Mill flours on this post, which I love. Firstly, they are based in Oregon, and since I was born there I already have an allegiance to them. Also, I learned that they originally started in the 1960’s with a set of millstones from a flour mill in North Carolina, which is where I grew up and live now. So it’s kind of like how your favorite sports team is usually the one from your home state. Is it weird I just compared baking to sports? Anyway, on to the potica. After all the mixing is done, it’s pretty simple. 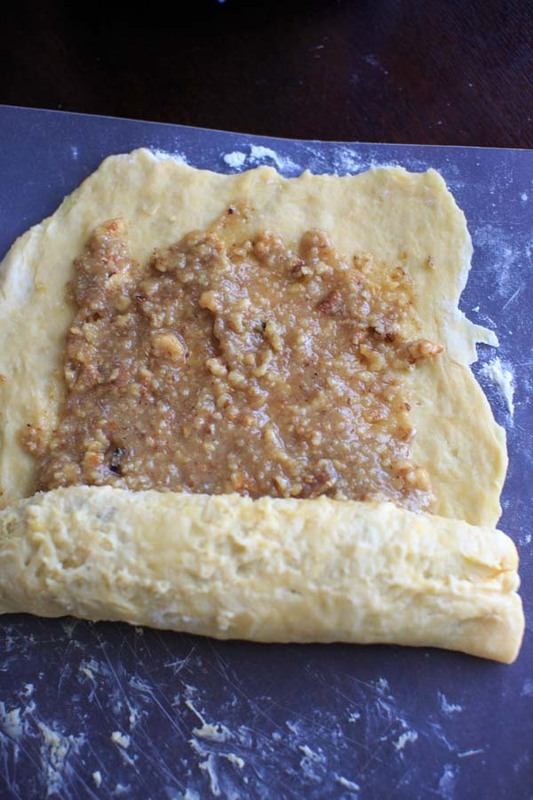 The yeast dough is refrigerated (trust me, this helps), then rolled out and a sweet nut filling is scooped on top. Then rolled tightly. Try not to overstuff the filling – if you have leftover you can always add it as a topping. I made 4 loaves out of my batch, but you can make 2 or 3 larger loaves if you prefer. You’ll just need a larger area to roll out the dough initially, but they will obviously be thicker rolls resulting in more layers. This makes each slice appear more “swirly,” if you will. I used the Bob’s Red Mill Organic Unbleached White Flour, which is freshly milled from Organic hard red wheat. Both the bran and the germ have been removed leaving the endosperm that is made into white flour. It is not enriched with any additives. This kitchen staple is incredibly versatile and perfect for all of your baking needs. By clicking here you can get a special coupon for $1 off. Everyone in my family loves this bread. My grandma brought some home from the funeral made by people at the church, my aunt also made this last week and TRIPLED the recipe, and by the time I made this and brought some home everyone was still eating it up. I hope you’re proud, Nana. Love you. 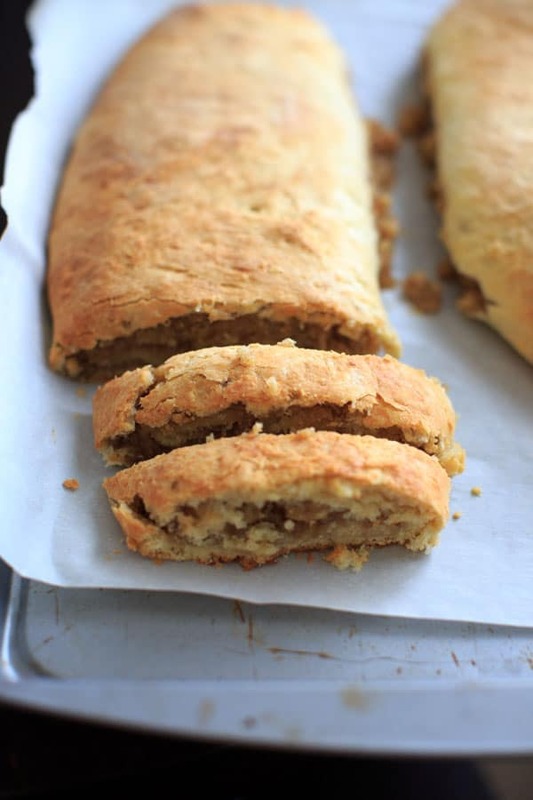 Nana's Potica recipe - a Slovenian nut roll traditionally served at Easter and Christmas. In a small bowl, add the yeast and water and mix together to make a paste. Set aside. In a large mixing bowl, cream the butter and sugar together. Add salt, egg yolks, sour cream, and start adding the flour 1 cup at a time until combined. Add the proofed yeast (should be bubbly) to the flour mixture and combine. Dough will be sticky. Remove dough from fridge and separate into 3-4 balls. Roll out each ball into rectangles (about 1/4 of an inch works well), adding more flour as needed to prevent sticking. 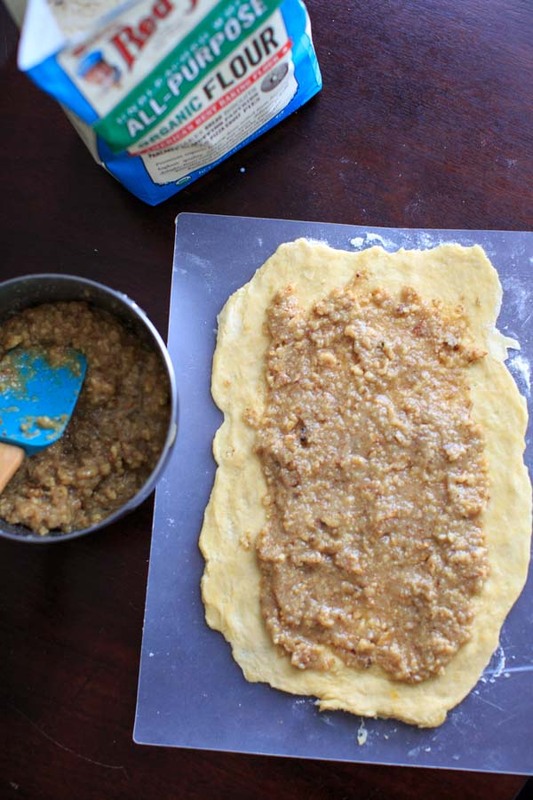 Mix together all ingredients for nut filling and spread evenly over dough, leaving a little room near the edges so it doesn't overflow when rolled. Bake at 350°F for 30 minutes or until browned. I tried this recipe by refrigerating the dough only briefly (30 minutes to an hour) and also overnight. 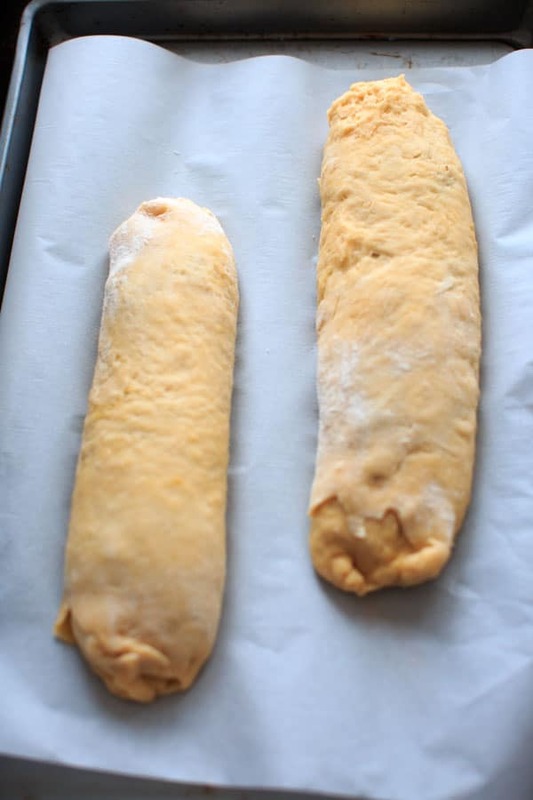 If you are in a hurry, it will still turn out mostly the same by refrigerating briefly but the longer time will help the dough be more manageable when you need to roll it out from my experience. **Calories are for 1/12 of a loaf. ***This nut roll can be served hot or cooled - whichever your preference! Kind of like a cookie. I prefer room temperature. My Great-Grandma used to make this, so I tried it. It turned out great ! Just wanted to share my Slovak grandmother made these also. You are correct about the refrigerated dough. One thing that helps them taste even more authentic is to use a sourdough made with apples as the yeast (tricky though if you haven’t worked with home-grown yeast before) the other item to mention is the sugar. In European countries like Slovakia and Slovania, shugar comes from the shugar beet- not shugar cane and the flavor is marvelous and, well, different Also many different granes of sugar available-in pasteries like this fine, or baker’s sugar is good. Hi Liz – make sure the water is very warm so the yeast dissolves. Since there is only 1/4 cup water with 2 packets yeast it might be a tiny bit watery but as long as the yeast dissolves in it should work for the rise. I am so sorry for your loss. I love finding old family recipes like this. Can’t wait to try it. My granny was an amazing baker too.. or at least that’s how I remember it! She made the best biscuits.. and she’d have no idea what a blog is if she was still around 😉 These potica look amazing! It makes me laugh to think to myself how I would try to explain a blog to my Nana now! Grandma’s are always the best bakers, right? I just love your Nana’s recipes! This one looks like a winner! I just ate dinner but this post made me hungry again! I want that for dessert! Nana’s recipes are always a hit! this one is awesome too. I made this for Xmas and it was better then the recipe I have been using for years. My family said the same. Thank you for sharing. I’m not always a big fan of nuts either but they are important in this recipe (since potica is a nut roll). You’ll end up with a completely different recipe without the walnuts, so because of that I don’t have a recommendation for a replacement. My mom makes something very similar to this and it is incredibly good! This looks just as delicious! I make it with black walnuts. I also use a refrigerator dough that raises very little it makes a very moist roll.